Thallus: rimose-to verrucose-areolate; areoles: 0.2-0.6 mm in diam., plane to subconvex, thin or thick upper surface: white or whitish gray, rough; shiny or dull, scarcely or abundantly grayish or whitish pruinose Ascomata: urceolate, sessile, slightly pruinose, up to 1.8 mm in diam. ; disc: blackish, concave; proper exciple: up to 70 µm thick; hymenium: 80-120 µm high asci: subclavate to cylindrical, 4-spored ascospores: brown, muriform, ellipsoid, 18-32 x 6-15 µm; transverse septa 4-6, longitudinal septa 1-2 per transverse segment Pycnidia: not seen Spot tests: K+ yellow to red, C+ red, KC-, P-, UV- Secondary metabolites: diploschistesic and lecanoric acids (both major) and orsellinic acid (minor). Substrate and ecology: on soil or mosses, juvenile parasitic on Cladonia spp World distribution: cosmopolitan in relatively open habitats in Mediterranean, temperate and polar regions and extending to high altitudes in the tropics Sonoran distribution: common, occurs in the studied area at an elevation of c. 250-4100 m in Arizona, Baja California, California and Chihuahua. Notes: The terricolous or muscicolous Diploschistes muscorum can be identified by the combination of 4-spored asci, juvenile parasitism, and the presence of lecanoric and diploschistesic acids. Similar species include D. diacapsis (distinction see under that species) and D. scruposus. 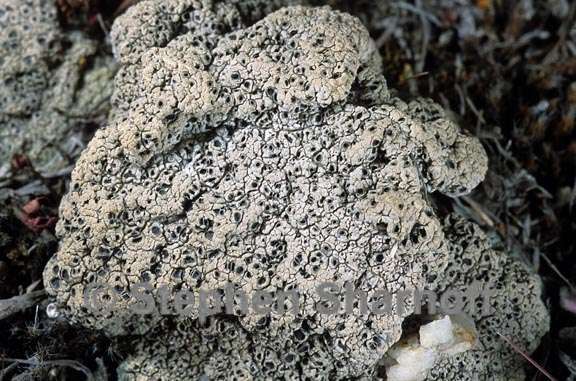 The latter species is a saxicolous and is not lichenicolous. It has an epruinose thallus, (4-) 8-spored asci, and may or may not contain diploschistesic acid.